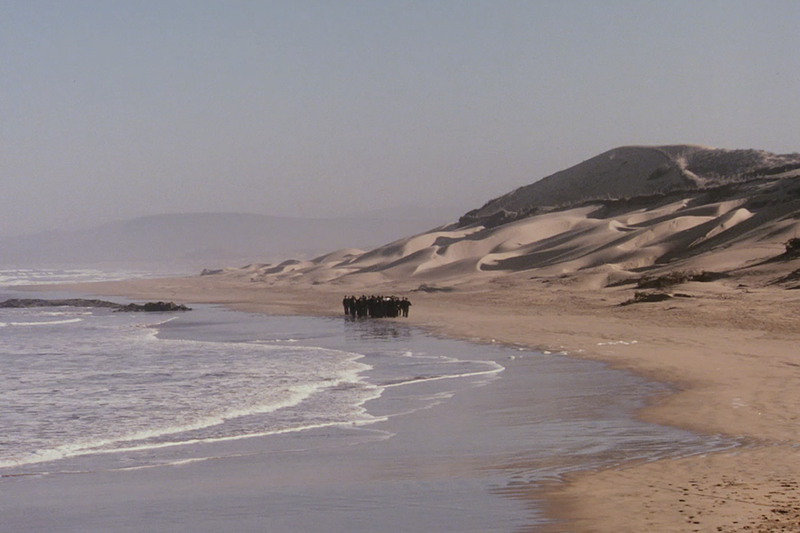 White waves wash ashore as a group of men slowly descend along a wide beach. All are dressed in black. Over their heads, they carry a body wrapped in white linen. Desert sand dunes form a stunning backdrop to their funeral procession. The scene, though unique, seems faintly familiar, a distant memory from bygone evening news. “It’s really a tragedy. This is really so wrong,” says Shirin Neshat as we’re following the movement of the body being carried over evening-sun-colored rocks. We’re all gathered in the small screening room of the Museum of Modern Art’s Media and Performance department. A screen is lowered and an array of technical equipment offers playback of almost any media format. Oversized leather chairs offer a certain post-production je ne sais quoi, while squeaking legs hint at their age. We’re watching the Digital Betacam version of Shirin Neshat’s Passage, which is the master video format the artwork was distributed in in 2001, together with a DVD exhibition copy. The editioned artwork is in both MoMA’s and SFMOMA’s collections, and this screening marks a significant event in a cross-institutional collaboration between the two museums over two years in the making. Shirin’s voice is soft. She never liked this version. She says the colors are wrong, the video is too dark, too contrast-y. We know about these shortcomings. When MoMA acquired this work in 2010, reviewing the video revealed issues with the quality of the image. Bringing Shirin into the conversation then, she confirmed that she was not happy with the material. And who could blame her? A work that was originally shot on 35mm film in the vast landscape of the Moroccan desert was now reduced to crummy standard definition video. Shirin’s own journey brought her from Iran to the US when she was seventeen years old. There she found herself subsequently stranded after the Islamic Revolution in 1979. After studying at UC Berkeley, she moved to New York City and, for almost ten years, abandoned art-making altogether. Following her first trip back to Iran in the 1990s, she began to work in still photography, presenting imagery of empowered femininity at odds with the restrictive aspects of Islamic fundamentalism she found in her own country. Not trained in this medium, Shirin established a collaborative way of art-making by working with professional photographers. Eventually moving from still photography to video, she started by presenting two-channel video installations, juxtaposing contrasting views of different aspects of Islamic life. She later shifted from video to film and used the collaborative nature of filmmaking to infuse her work with a multitude of voices and perspectives. From these early experiments with film emerged works such as Pulse (2001), Possessed (2001), and Passage (2001). 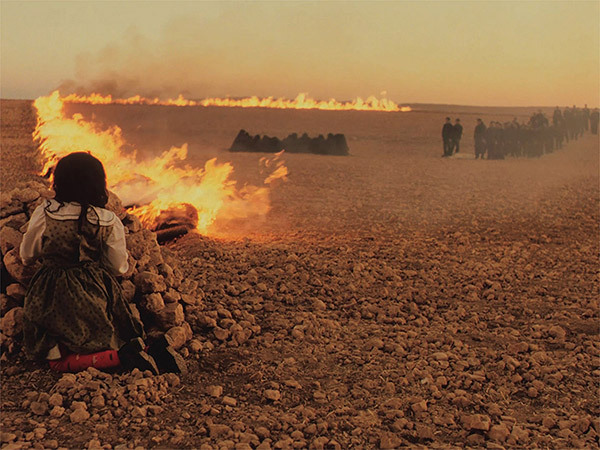 Philip Glass commissioned five filmmakers—Peter Greenaway, Atom Egoyan, Godfrey Reggio, Michael Rovner, and Shirin Neshat—to create short films for which he would write the score. 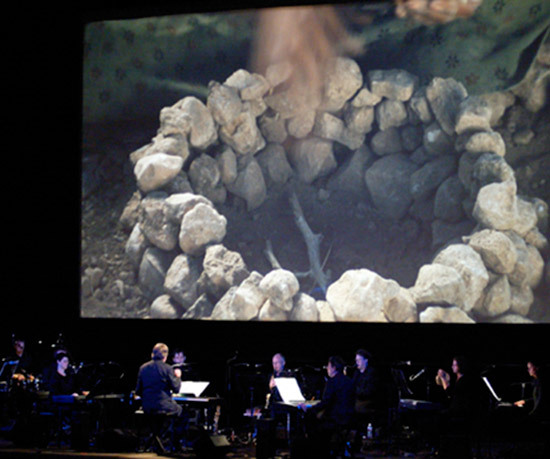 These silent films were presented as a performance accompanied by a live orchestra, and premiered at the Lincoln Center Festival in 2001 before Glass took them on his Philip on Film Tour. 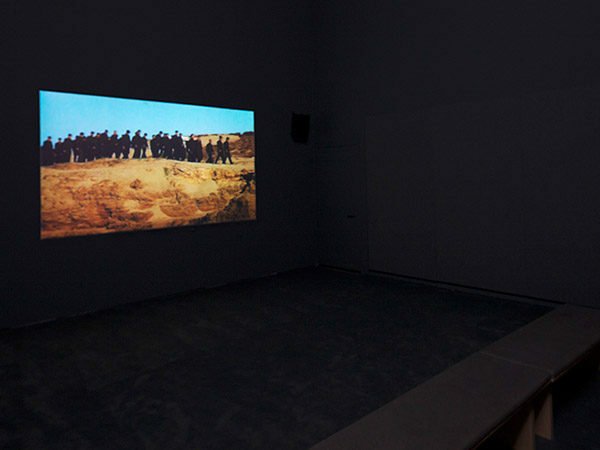 Following the premiere event, Shirin decided to turn the film into a single-channel video installation. She re-edited the sound, cropped the full-frame image to 16:9 letterbox, and finalized it on Digital Betacam tapes and DVDs as an edition of five with one artist proof. In 2013, three years after their initial conversation with the artist, curators and conservators at MoMA picked up the thread of the unresolved quality and format issues of Passage. Resurfacing these considerations, Shirin found a 35mm positive print in her studio. A side-by-side comparison of the two materials was set up, and, projected next to each other, the depth and expansiveness of the film version was uncanny. The vibrant and crisp colors of the high-quality film stood in stark contrast to the muddied nature of the video. In an instant, what Shirin had been describing for so many years became blatantly obvious. The collaboration with Philip Glass was a first for Shirin on many levels. Straying from her typical collaborator, the Iranian composer and singer Sussan Deyhim, it was the first time she worked not only with a Westerner but with a man. When conceptualizing Passage, Shirin created a performance of what’s intended to be an obscure funeral ritual inspired by the Islamic faith. She began to assemble rough edits and shared them with Glass, who simultaneously composed the soundtrack. Over time, her fears that Glass’s Western minimalism would not pair well with the emotional aspects of her imagery dissolved, and the piece was performed live in 2001. When the new material surfaced in 2013, MoMA scanned Shirin’s film to a high-definition video and produced an internegative film—an intermediary analogue film format from which future positive film prints could be created—as a preservation master for their archive, as well as a positive print copy. However, amidst all the excitement over the tremendous gain of image quality, one detail fell through the cracks: the different aspect ratios of the two sources, full-frame and 16:9. The screening room turns dark, as the last credits of the Digibeta video of Passage roll into black. We take a quick look at the exhibition copy DVD, before relieving Shirin of all unsightly video versions. We bring up MoMA’s 2013 high-definition film digitization next. This version is her favorite by far. 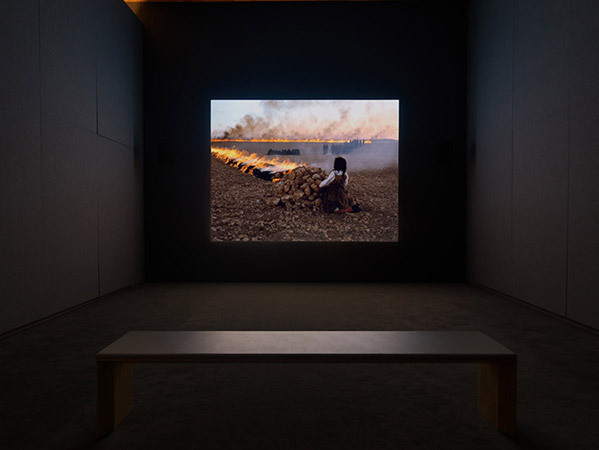 It has since then become the de facto master and is also the version that SFMOMA showed in 2016, when Passage was exhibited at the newly reopened museum’s inaugural show. Leading up to this opening, an unusual collaboration began: as two of the edition holders of this video installation, MoMA and SFMOMA joined forces to pursue the highest-possible quality master. Not that there was anything wrong, per se, with the digitization MoMA did in 2013. Then, it was a high-quality choice of format. Coming from 35mm film, however, it is not the best quality available today. Sharing resources and staff time, the two museums decided to redo the high-definition digitization by scanning MoMA’s archival internegative to a 4K film scan, more than doubling the resolution. However, when we show her the new 4K digitization, Shirin cringes. We’re not happy with this new 4K version either. The colors are too red and the lack of contrast swallows the different shades into indistinguishable black shapes. There is a lot of dust all over the picture, and the soundtrack seems to have been amplified into distortion. When we set out to create this higher resolution digital scan, we didn’t consider the significant generation loss we’d incur by using MoMA’s second-generation internegative instead of going back to the artist’s print again. It is clear after watching it for a few minutes that this version is indeed unusable. Having Shirin here with us, however, gives us the possibility of addressing the other discrepancies we’ve found. What’s the story with the two aspect ratios? 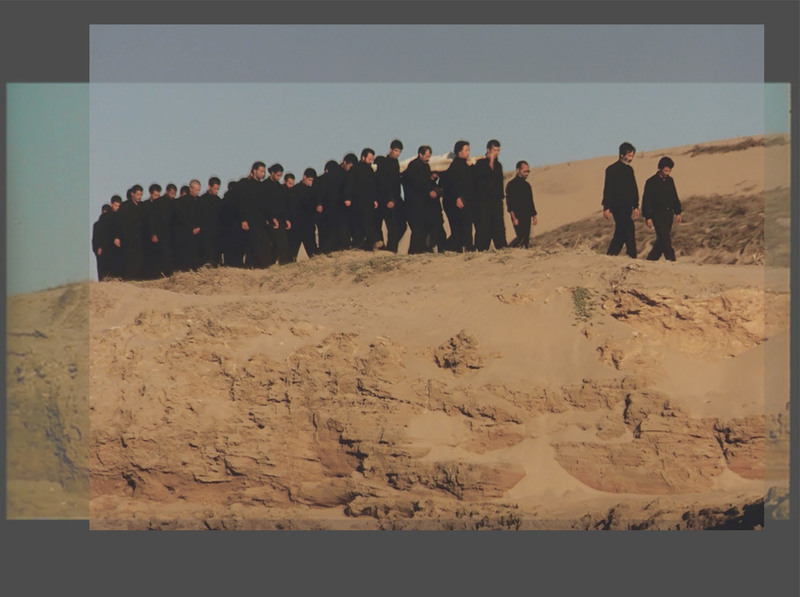 Why, when comparing the 16:9 Betacam video and the full-frame film version, is there a strip of image missing on the left side of the latter? Shirin talks about how she liked the more cinematic look of the 16:9 version. She goes back and forth in her opinion, though, and ponders whether she would do it again in this way today. She laments that she seems to have no choice, ultimately, since the only acceptable version at present, quality-wise, is the 2013 full-frame film scan. Then she goes on to explain the reason for the missing image strip: when Philip Glass projected the films in 2001, they were all silent films. Afterwards, she got her positive print copy, which included the music score on the film. This optical soundtrack takes up actual real estate on the film material, sacrificing a vertical stripe of imagery on the left. In summary, what we ended up with today are a low-quality video version that was cropped to 16:9 on the top and bottom, and a high-definition film scan that does not represent the highest quality possible and misses a strip of the image. We hit a pause in the conversation and for a second everyone follows their own thoughts. The panacea that the original silent negative represents, so out of reach and lost to the history of time, looms over us. This uber-master would allow us to go either route, create a high-quality 16:9 single-channel gallery version and obtain a full-frame artifact of the 2001 performance with Philip Glass. It would give us a choice for display, which currently is eliminated by the rift in image quality. Such a deep dive for a master—in which conservators almost take up the role of studio assistants, helping the artist to retroactively produce the work she always envisioned, ultimately influencing the perception and presentation of the work—is not a typical path for museums to take. Traditionally, we tend to conserve what’s presented to us, albeit in the highest possible quality. As contemporary artworks evolve over time, however, and take on different life forms, the role of the institution transforms as well, and our decisions are bound to have an impact on certain developments in an artwork’s life. In this case, the artwork has already undergone different iterations: first it was a performance, then a 16:9 single-channel video, until it became a full-frame video installation. Who decides that this evolution has now ended? Well, the missing source material, for one. A few months later we receive an email from Pomegranate Arts, Inc., letting us know that they found a Betacam SP video tape, an image of the 2001 performance, as well as a 35mm film. It sounds too good to be true; and indeed the Betacam tape is a dead end, showing a recording of scenes with switching aspect ratios for which we have no explanation. The image of the performance shows a full-frame projection, even further cropped than our film version. The film itself is being shipped as of this publication. In a little while, we will find out whether our multiyear quest for the original negative has reached an end, or if yet another life form will materialize—be it through the new source itself or because of it­—adding to the multifarious history of this work. 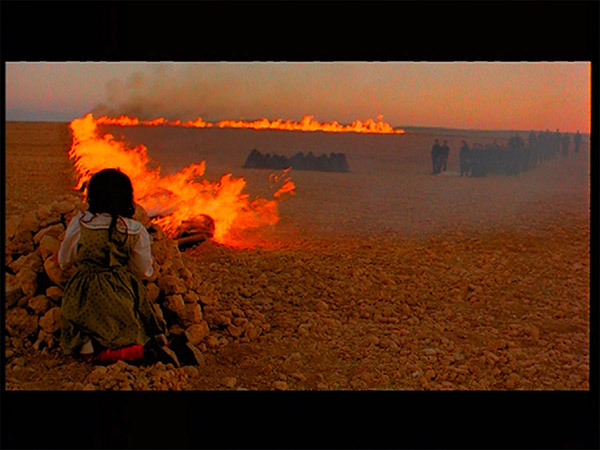 Shirin Neshat’s Passage (2001) was acquired by MoMA in 2010 and is part of the the Doris and Donald Fisher Collection at SFMOMA. Any findings from this project will be distributed with all edition holders through Shirin Neshat’s gallery representative. All of Shirin Neshat’s quotes are from a study day with her at MoMA on May 24, 2018. Talking to the artist were Martina Haidvogl (SFMOMA), Peter Oleksik (MoMA), Rachel Jans (SFMOMA), Flaminia Fortunato (MoMA), and Caroline Gil (MoMA). Scott MacDonald, “Between Two Worlds: An Interview with Shirin Neshat,” Feminist Studies, Fall, 2004. Martina Haidvogl is the Associate Media Conservator at SFMOMA, where she has piloted documentation and preservation initiatives for the Media Arts collection since 2011. 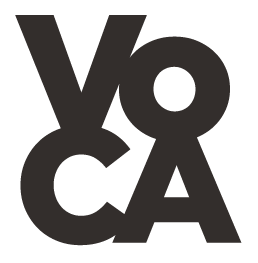 Cite this article as: Martina Haidvogl, "Challenging the de facto master," in VoCA Journal, March 15, 2019, http://journal.voca.network/challenging-the-de-facto-master/.